Edmonds recorded 60 carries for 208 yards and two touchdowns while hauling in 20 of his 23 targets for 103 yards across 16 games during the 2018 campaign. Edmonds ran four times for 20 yards and added a one-yard reception during Sunday's 31-9 loss to the Rams. Analysis: Edmonds has now recorded at least five touches in five of his last six games, averaging a respectable 4.2 yards per carry during that span. 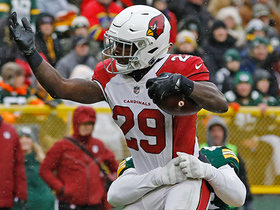 A two-touchdown explosion in Week 13 aside, the rookie has been quiet for much of the season, a byproduct of playing on a woeful offense behind a quality do-it-all back in David Johnson. Edmonds ran for 22 yards on eight carries and added 22 yards on two catches during Sunday's 40-14 loss to Atlanta. Edmonds had three carries for 14 yards and returned one kickoff for 17 yards during Sunday's 17-3 defeat to the Lions. Analysis: Acting as the clear No. 2 running back behind David Johnson, Edmonds has been afforded a shade over five touches per game this season. However, outside of a Week 13 outburst in which he totaled 66 yards from scrimmage and two touchdowns, Edmonds has averaged a dismal 2.7 YPC with no end-zone visits. In reality, the aforementioned outing was an aberration, meaning anyone who took a chance on the rookie should get used to performances like Sunday's. Edmonds rushed five times for 53 yards and two touchdowns while hauling in both of his targets for 13 yards in Sunday's 20-17 win over the Packers. 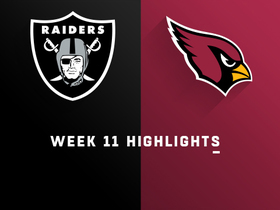 Analysis: Edwards only got five carries to David Johnson's 20, but the rookie scored both of Arizona's touchdowns, much to the chagrin of the embattled early pick's owners. In addition to his 6-yard score in the second quarter and 8-yard touchdown in the third, Edwards also peeled off a 29-yard run. 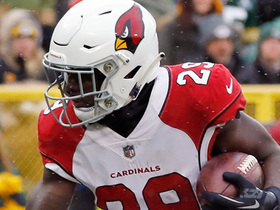 Johnson is still Arizona's primary running back -- as evidenced by the workload distribution -- but Edmonds may have earned himself a few more carries in Week 14 against the Lions and beyond. Edmonds ran five times for zero yards during Sunday's 45-10 loss to the Chargers. Analysis: Edmonds also returned one kick for 13 yards. 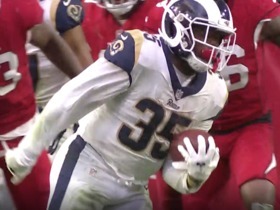 The rookie fourth-round pick's five carries tied a season high, but he was unable to make any sort of impact with his touches against the Chargers' revitalized run defense. He'll look to bounce back against the Packers in Week 13. Edmonds ran for 17 yards on five carries during Sunday's 23-21 loss to Oakland. Analysis: The five carries tied a season high for Edmonds, though he struggled to make much of them against a Raiders run defense that is among the worst in the NFL. Edmonds, after catching nine passes in his first two games, has been quiet in the passing game as of late, but he gets a somewhat favorable matchup on the ground Sunday against a Chargers defense surrendering 4.6 yards per carry, placing them among the bottom half of the league. Edmonds notched two carries for seven yards during Sunday's 26-14 loss at Kansas City. Analysis: Yet again, Edmonds did little more than spell David Johnson, who accounted for 183 yards from scrimmage and both of the Cardinals' touchdowns on the afternoon. To make matters worse, Edmonds wasn't the most productive reserve running back. That honor went to T.J. Logan, who hauled in both of his targets for 14 yards on three offensive snaps. Sure, Edmonds handled 17 such snaps, but his outlook appears barren due to the amount of volume taken on by Johnson. Edmonds took two carries for nine yards and corralled one of two passes for 12 yards during Sunday's 18-15 victory against the 49ers. Analysis: After going five games without a catch, Edmonds has been involved as a receiver the last two weeks, helping him post exactly 21 yards from scrimmage in back-to-back contests. 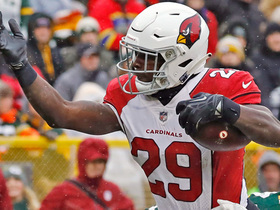 In the wake of working under a new offensive coordinator, his touch count didn't waver from its typical handful, so the rookie running back isn't much more than a David Johnson handcuff at the moment. Edmonds totaled five carries for nine yards and three catches (on three targets) for 12 yards during Thursday's 45-10 loss to the Broncos. 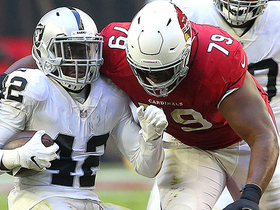 Analysis: In what quickly became a blowout, the Cardinals gave Edmonds his most run of the season -- 22 snaps on offense -- which he turned into his second-most yards from scrimmage (21) as a professional. The Cardinals axed offensive coordinator Mike McCoy on Friday, so it remains to be seen if Edmonds' workload will be little more than scraps left behind by starter David Johnson, or something more. At the very least, Edmonds' do-it-all skill set allows him to get involved in all aspects of the offense. Edmonds played four of 58 offensive snaps during Sunday's 27-17 defeat in Minnesota. Analysis: Edmonds had a semi-promising start to his rookie campaign, combining for 68 yards from scrimmage on 14 touches over the first two games. However, in four games in the interim, he's mustered 14 yards on 10 carries and hasn't been targeted. With David Johnson handling his usual workhorse role, Edmonds hasn't been afforded much of an opportunity lately to replicate his early-season success. Edmonds (back) is officially active for Sunday's game at Minnesota. Analysis: Edmonds received the questionable tag after being added to the injury report Friday, but he's well enough to give it a go Sunday. The 22-year-old should serve his usual role behind workhorse David Johnson, who has dominated the touches out of Arizona's backfield. 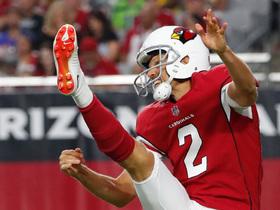 Edmonds is questionable for Sunday's game in Minnesota due to a back injury, Darren Urban of the Cardinals' official site reports. Analysis: Edmonds presumably suffered the injury during Friday's session, as he avoided the injury report before that juncture. Working in his favor, though, was a limited showing, suggesting his practice reps were capped as a precaution. 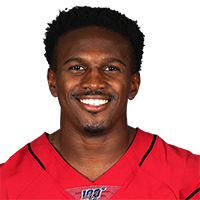 If he's deemed active Sunday, Edmonds will do little more than spell David Johnson, who has accounted for 60 of 68 touches given to Arizona running backs the past three games. Edmonds carried the ball once for a loss of a yard and was unable to connect with Josh Rosen on his lone target during Sunday's 28-18 win over the 49ers. Analysis: The Cardinals finally broke through on the scoring thanks to five San Francisco turnovers. It did little for Edmonds, who has all of 10 yards on nine touches over the past three weeks. Don't expect much of a reprieve Sunday. The Cardinals take on a Vikings defense ranked 12th in the league in opponent yards per carry. Analysis: Edmonds has seen his touches and yardage decrease each week since his eight-touch, 48-yard season debut. The Cardinals' offense has improved but still ranks near the bottom of the league. All the while, Edmonds has seen his role in the offense decrease. The Cardinals next take on a middle-of-the-road 49ers run defense, but Edmonds hasn't shown nearly enough to pay him much attention. Edmonds rushed for 10 yards on five carries during Sunday's 16-14 loss to the Bears. Edmonds snagged all five of his targets for 15 yards and added a five-yard run during Sunday's 34-0 loss to the Rams. Analysis: It hasn't been for much yardage, but there seems to be a concerted effort to get Edmonds touches in Arizona. The problem has been that the Cardinals have fallen behind early in back-to-back weeks and have looked vanilla on offense. Until the Cardinals are able to play more balanced and take some shots downfield, it's going to continue to be a tough ride for Edmonds. 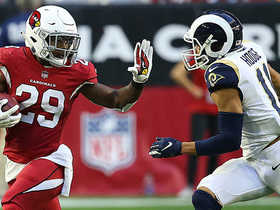 Considering the team has yet to find a way to unleash star David Johnson, brighter days are not guaranteed in the desert. Edmonds notched four carries for 24 yards and gathered in all four passes for another 24 yards during Sunday's 24-6 loss to the Redskins. Analysis: Edmonds didn't receive a touch until the game was out of hand in the second half, but among his 17 offensive snaps, he was utilized on nearly half of them, finishing third in yards from scrimmage behind Larry Fitzgerald and David Johnson. In a closer contest, Edmonds likely will be hard-pressed to wrench touches from the workhorse that is Johnson. No matter, Edmonds' pro debut is an encouraging sign for his potential in the event a bigger workload is presented to him. Edmonds rushed 11 times for 55 yards and caught both of his targets for eight more in Sunday's 27-3 preseason win over Dallas. Analysis: Edmonds got an extended look in the first half with starter David Johnson getting the night off, and the rookie made the most of his opportunity by averaging five yards per carry. T.J. Logan also had a big day highlighted by a 59-yard touchdown, but Edmonds appears destined to serve as the primary backup to Johnson once the games start to count. Edmonds took five carries for 11 yards and a touchdown in Saturday's 24-17 preseason win over the Chargers. Edmonds received reps with the first-team offense during mandatory minicamp this week, Darren Urban of the Cardinals' official site reports. Arizona Cardinals running back Chase Edmonds takes the fake punt and runs for 20 yards. 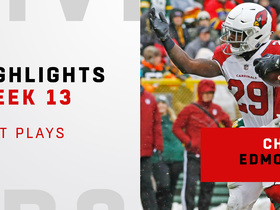 Watch the best plays from Arizona Cardinals running back Chase Edmonds Week 13 when he faced the Green Bay Packers. Arizona Cardinals running back Chase Edmonds rushes for an 8-yard touchdown. Arizona Cardinals running back Chase Edmonds rushes for a 29-yard gain. Arizona Cardinals running back Chase Edmonds rushes 8 yards for a touchdown. 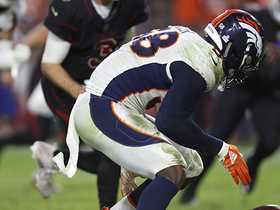 Denver Broncos linebacker Von Miller strip-sacks Arizona Cardinals quarterback Josh Rosen for a fumble recovery for the Denver Broncos.